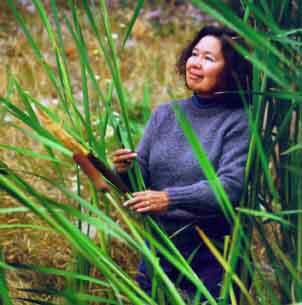 Program 306 – Artist’s Circle | Wisdom of the Elders, Inc.
Pat Gold is Wasco and Tlingit. She was born and raised on the Warm Springs reservation in Oregon. For many years pat worked as a professional mathematician, but then her life took a very different path. Deep within herself, she rekindled a love of traditional tribal baskets. Once Pat started weaving baskets herself, her life was changed forever. Honor the Frog Wasco Wally Baskey by Pat Courtney Gold. Courtesy Chemeketa ArtWalk. It just opened a whole new door for me. 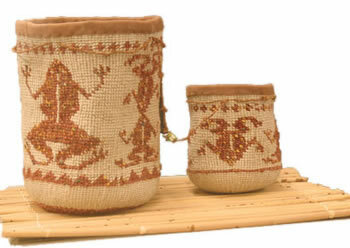 The Wasco baskets are unique because they have geometric images. And they’re also unique the way they’re made. It’s called a full turn twine. One elder went to different reservations to see if she could find people who still had some relic of knowledge of these techniques, and she did. She found people who remembered parts but not the complete way to weave a basket. There were different ways to start the baskets. There were different ways to end the baskets, but the important part of the full turn twining to make the geometric images. So my sister and myself and Orlene Borlue, who lives in Warm Springs, the three of us learned how to do this technique. So we are the three people who helped revive this technique. As Pat gained in knowledge, she wanted to learn more about her tribe’s basketry. She felt compelled to quit her job to embark on her own voyage of rediscovery, traveling across the country to visit museums with Wasco baskets in their collections. She especially wanted to see a basket purchased by Lewis and Clark in 1805. So I called the Peabody Museum and introduced myself and told them why I wanted to come back and look at that basket. That basket when I first saw it, I didn’t think I could imagine a design that intricate. It was horizontal petroglyph faces and surrounding was a geometric design. And it completely encircled the basket so you never knew where the pattern began. You didn’t know where it ended. My breath just flew out of my mouth when I saw this basket. I couldn’t even talk. It was so beautiful to see it and I looked at it and it was just like it was beckoning to me. So I thought I would love to just be with this basket all by myself. And I knew my ancestors’ spirits were with that basket. I just knew it I could feel it. Once I picked it up I couldn’t let it go. I held it like a little baby and I could just feel everything in the basket. It ‘s so overwhelming and so emotional, so spiritual all I can do is just to sit here. I think I was the first Wasco person to pick it up in 200 years. And the basket was letting me know that the faces were petroglyph faces. And these faces were made by my ancestors. And the petroglyph faces had a lot of stories along the Columbia River. They’re petroglyphs themselves. Pat’s rediscovery of her tribe’s weaving traditions sparked her efforts to help form the Northwest Native American Basketweavers Association, to collectively seek to share, preserve, and celebrate Indian basketweaving in the Pacific Northwest. is racing and it is coming up with all these other images. So I’ve made about 7 baskets with that design since I’ve come back from the Peabody. And everyone of them is different. Today, Pat Courtney Gold is internationally recognized for the art of full-turn twining. Her contemporary works combine traditional Wasco techniques with non-traditional materials in both two- and three- dimensional forms. She is the recipient of numerous awards, including the Oregon Governor Arts Award and the Community Spirit Award through the First Peoples Fund. For Wisdom of the Elders, I’m Bruce Crespin.